At first glance I thought this was some madcap knife thrower's dream come alive in kitchen accessories. Alas, this set-up includes forks and spoons, too. And actually, I can't imagine that throwing them haphazardly would work very well, as they each have their own separate niche to hide away in, supported by the fine science of magnetization. In fact, this 24" square tile entitled Forked Up was intended as a pointedly alternative way to store silverware (gently placed, not thrown), created by the cats at the Toronto-based Thout design group for their UtiliTILE line. 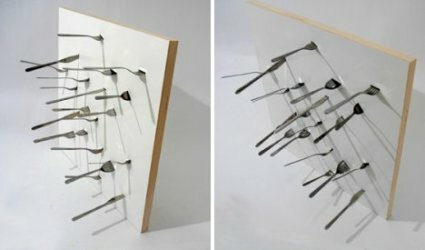 Who needs a boring old drawer when you could have this conversation piece adorning a wall, allowing you super-easy access to all your cutlery needs? Along with this wholly fascinating structure, Thout has several other space-saving design ideas sure to make urban living easier, or at the very least, more interesting. Fruity is your friendly helper for displaying only the finest of produce, possibly alongside condiments, spices, or whatever you fancy. 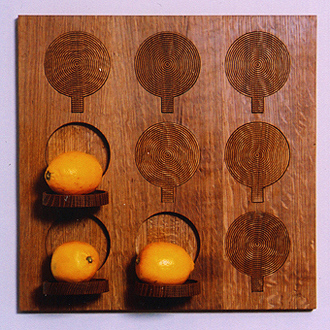 An artful way to hold common kitchen items, and all without taking up precious counter space. Now that's innovation. 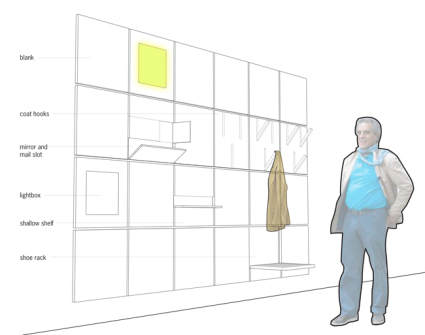 And moving out of the kitchen, Thout brings us this ever-practical, modular wall storage system, aptly called Cast Out Your Clutter. 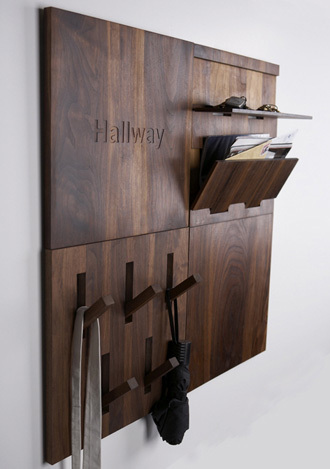 Made up of as many 16" tiles as you deem necessary for proper organization, this system offers several helpful storage tools, like hooks for coats, shelves for keys and shoes, mail slots and even a mirror so you can check out your fine self on the way out the door. And the best part is that when not in use, the shelves and hooks fold back into the wood tiles to create an open expanse of space, in your choice of three different finishes. There's a lot more to Thout than I've touched on here - for some unique and varied design ideas, I'd suggest checking them out for yourself.